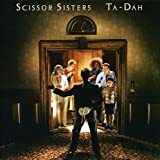 New York's flamboyant Scissor Sisters are at their best as a cover band, getting themselves and their listeners off on the glee of reinventing familiar hits in warped, over-the-top ways. But somehow, Ta-Dah feels like the Sisters covering themselves, and the glitter and gloss have worn off. Though elastic frontman Jake Shears is at his best when glorifying excess, the band's follow-up is set the night after the party, with tunes about trading circuit parties for domestic comforts and hangin' up his dancin' shoes. Even framed by a tempered version of the Sisters' club-friendly glam-pop that sounds closer to Billy Joel than even Elton John (who co-penned the lead single), the subject matter seems out of sync. And save for the über-gay saloon-Mikado piano shuffle of Intermission, there are few surprises.